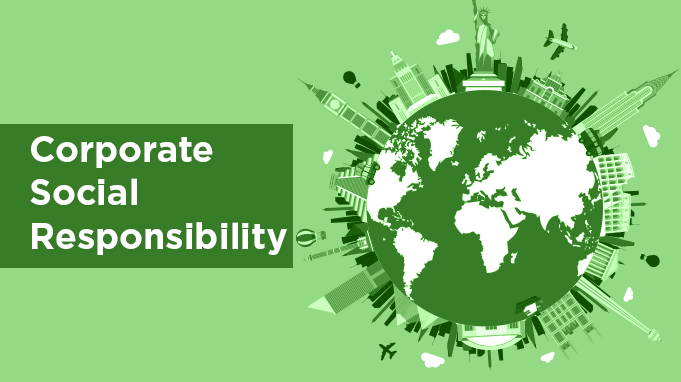 Corporate Social Responsibility is a way to management by which companies try to make a balance between economic, social and environmental essentials. In simple words, we can say that it is a way for companies to take responsibility for the environmental and social impacts of their business operations. The words Corporate Social Responsibility explains itself. Every corporate house does some production that makes some leftovers. So handle with those leftovers and make the things Eco-friendly companies should do some awareness programs. They should do someday outings for the cleanliness drive. Do donations in between unprivileged people nearby your workplace. It could be in terms of financial help, cloth donation, footwear donation, distribution of food packages etc. If there is any conference or meeting is organized at your place. Then all event stationary which is not used and left by delegates at the venue. Try to distribute those materials among children nearby. Clean a nearby park or playground in the morning or afternoon of an event day. Try to go digital instead of paper products for any documentation thing in your even. For example provide a PDF that can be emailed or downloaded rather than print out. People who could not ordinarily afford to attend your event but they are interested in, reserve some space for them in your guest list. Donate event t-shirts and extra goodies to any charity. Try to donate leftover flowers to a local nursing home. Instead of single-serve plastic water bottles, supply reusable water bottles to the guests. They’re also good for sponsorship opportunities. Collect holograms and name badges from your team member as they can be used at your next event. Go for the online registration process, it will help keep you more organized and save paper. Book with hotels that support green and energy-efficient initiatives. Buy fair-trade when possible and Source your needs locally. Above all the given points you can do any kind of social or charitable activity. That could be be a cause of betterment and wellness of the society. These type of companies who actively participate in social causes are more favoured by customers. It is a psychological thing. But people including customers and employees both find companies with social responsibilities as more approachable. Sending out messages about your corporation’s philanthropic attitude will do good to design the public image. As it reflects an empathetic side of the company. Corporations can do that by supporting nonprofit organizations or through donations. Companies which are perceived as less self-regarding are actually favoured by customers. It may be psychological but somehow people find companies with social responsibilities as more approachable. Sending out messages about your corporation’s philanthropic attitude will do good to design the public image as it reflects an empathetic side of the company. Corporations can do that by supporting nonprofit organizations or through donations. To be in the good books of politicians and government regulators, companies must present a positive public towards public of its seriousness about social responsibility. This is not only the best way to make easier contacts with government officials but also to avoid various investigations and probes or even public campaigns. This is one of the reasons why companies from past incorporated CSR in the first place. But since it is a common phenomenon now, corporations are trying out new ways to build up their goodwill by experimenting on their social responsibilities. They are not only taking it seriously but bringing in a lot of creativity so that they serve their visionary purpose along with creating a distinct image for themselves in the market. In conclusion these activities enhance the relationship between the highest management to the lowest paid workers as they go on to believe that a united approach could do wonders. Corporations that care about the lives outside the barriers of their business kind of inspire and motivate employees to walk into work each day eagerly.